produces just the value, not the name and value, nor do any of the print statements get hit. The global ToDump hook is only valid in My Extensions, not individual queries. I've taken a look at whether it would easy to allow My Extensions to be written in F#, but unfortunately, there's a fair bit of work involved. So the only option right now is to write the ToDump in C#. I was under the impression that you could use C# extension methods to customize dump behavior in individual queries, is that not the case? 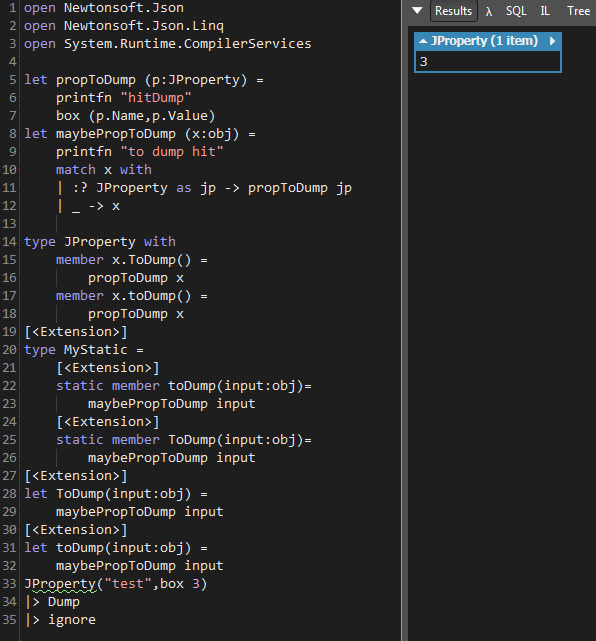 One of my attempts above should be seen by C# as toDump extension methods on object. Any word on this possibility? Are all the ToDump hooks, available to F#, only available per type, with no ability to hook in or inject? Can we please have a way to hook/override type-specific (for types we aren't creating) (or global) dumping in linqpad for F#?